Fragrance oils can drastically change the outcome of cold process soap recipes. Fragrance oils may quicken trace, cause an uneven texture, cause separation or discolor the soap. Fortunately, soap suppliers provide performance results for cold process soap. In this article, we will explain how fragrance oils are tested and what the results mean. Wholesale Supplies Plus uses a basic cold process soap recipe that is slow-moving and white in color. The recipe consists of 50% Olive Oil, 20% Sunflower Oil, 15% Coconut Oil, 10% Shea Butter and 5% Castor Oil. The water to lye ratio is 2.5:1 and the soaping temperature is 120º Fahrenheit. Each fragrance oil is added to two ounces of soap batter and the performance is evaluated when it is first mixed, when it is poured into the mold, five minutes after the pour, when it is removed from the mold and finally after four weeks of curing. The oils are evaluated on acceleration, ricing, separation and the final discoloration. Acceleration refers to the speed at which soap batter begins to saponify and harden. The classifications are none, slight, moderate and seize. “None” means the soap batter was fluid when the fragrance was first mixed, when it was poured into the mold and five minutes after the pour. Fragrance oils with no acceleration are perfect for soap swirling and other intricate designs. “Slight” means the soap remained liquid when the fragrance was first mixed in and when it was poured into the mold. After five minutes, the soap batter began to thicken slightly. Fragrance oils with slight acceleration perform best with slow-moving recipes and lower soaping temperatures. These fragrance oils are trickier to use for swirls, but with the proper precautions can be used in swirled soap designs. “Moderate” means the soap remained liquid when the fragrance was mixed in the soap but thickened when it was poured into the mold. Fragrance oils with moderate acceleration are best for single color soaps and other simple designs. They are not recommended for swirled designs. We recommend hand mixing these fragrances instead of stick blending. “Seize” means the soap thickened when the fragrance was first mixed into the soap and quickly solidified. It may even change texture. Fragrance oils that seize are not recommended for cold process soap making. These fragrance oils are suitable for melt and pour soap and other cosmetics. Ricing refers to uneven saponification where lumps of soap develop in the soap batter. The classifications are none, mild and severe. “None” means the soap batter and finished soap remained smooth. “Mild” means the soap batter had some small lumps. Stick blending the soap batter will most likely remove the lumps in mild ricing fragrance oils. “Severe” means the soap batter became very lumpy and uneven. Fragrance oils with severe ricing are not recommended for cold process soap making. Separation refers to ingredients separating out of the soap. It may appear right away or while the soap is saponifying. The classifications are none, mild and severe. “None” means the soap stayed completely together. “Mild” means there were some signs of separation such as little droplets appearing on the surface of the soap within 48 hours. Sometimes the droplets will soak back into the soap. Mild separating fragrance oils should be used with caution in cold process soap making. Always test the pH of any soaps that have any indication of separation. “Severe” separation means that pools of liquid separated from the soap. Fragrance oils with severe separation should not be used for cold process soap making. Discoloration refers to the color of soap after four weeks. This information is helpful when planning soap designs. Some color changes are unavoidable, but others may be eased by using a vanilla color stabilizer. Keep in mind that there are other factors besides fragrance that can affect performance. Acceleration can be sped up with hard butters, castor oil, beeswax, water discounts, and high soaping temperatures. 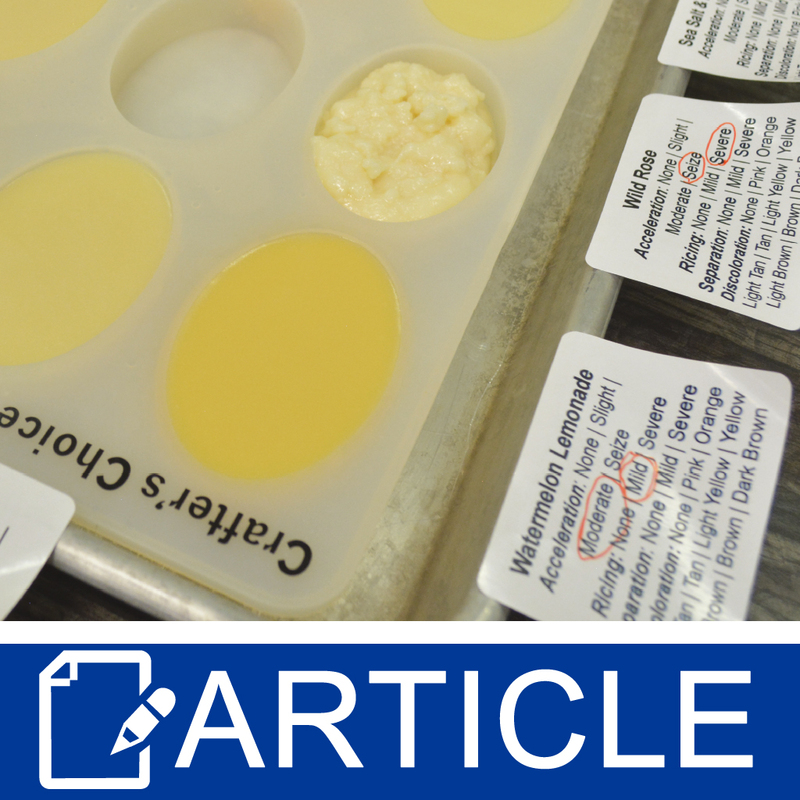 Discoloration can occur from the oils and butters in the recipe as well as other additives. Now the really hard part…to pick which one to use! There are so many options! !